So, I just received this picture from my sister and thought that it had to go up on the blog! Sorry Josh! These two always goof around with each other and usually get into trouble of some sort. It obviously makes for good laughs all the time! Sadie is already down 2 teeth! She lost the second one at church on Sunday. During sacrament meeting she handed Josh a tooth, and he handed it right over to me! 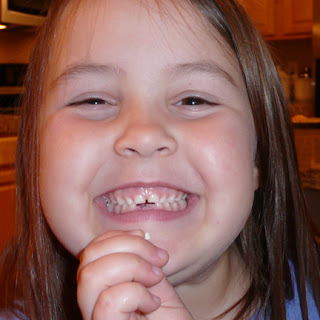 She is very excited to be losing teeth. 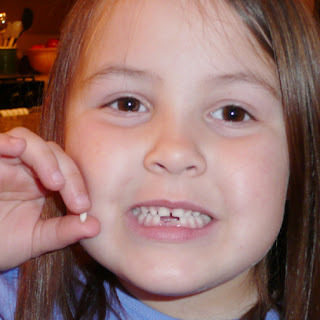 I think that it is only because the tooth fairy gets to come and visit! 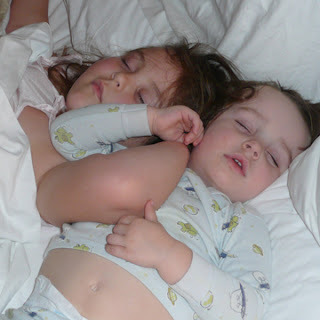 I have two kids that love to be wrapped around a body to fall asleep. This picture proves my case! We went out to lunch with Josh's parents, Morris and Dorothy, while they were here visiting. 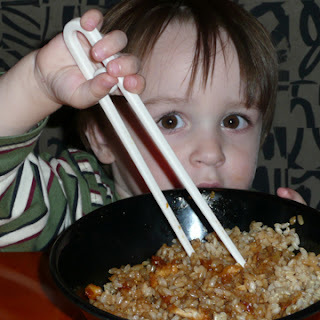 Sam decided at lunch that he was going to eat his lunch the most difficult way possible for a two year old, with chopsticks! It was interesting. He was captured giving a glance to Grandpa. The look says it all! 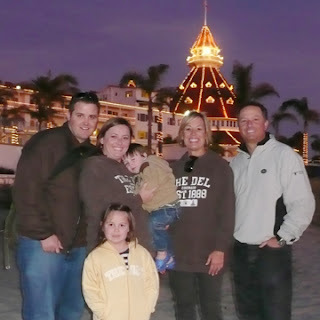 While we were in San Diego we stayed on Coronado Island. 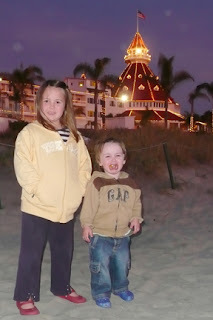 We were lucky enough to stay at "The Del Coronado." It was beautiful! Our last day we played on the beach ate lots of food and went for a drive to the border! What a wonderful trip! Thanks mom and dad! We had a blast with you! I promise Sam had a good time! Day 3 took us to Sea World. It is always fun to see all of the fun shows at Sea World. It was neat to see the "Shamu" show set to Christmas carols. It was a new twist on an old favorite! We had a specatular day and the kids really enjoyed themselves! They knew we were coming! 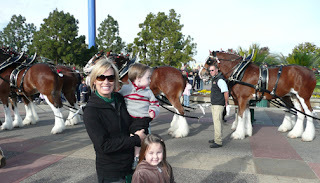 Right when we walked in the Clydesdale horses pulled up right in front of us! It is pretty amazing to see these horses up close and all put together like they are. Sadie was in shock and Sam liked the dalmation that was perched on top of the wagon! Sadie was tall enough to ride "The Artic Zone" ride with Josh. 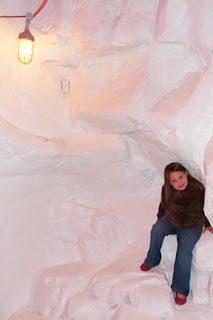 She then climbed into the polar bear cave. Josh said she wasn't too excited to be in there because of the recorded sounds that were being played. I can understand. She still is smiling for the camera though! 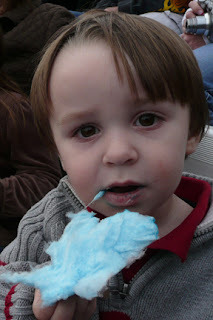 I gave in and bought the kids some cotton candy for one of the shows. I just thought that the piece that Sam grabbed was about as big as his head! Day 2 of our adventure took us to the San Diego Zoo! It was a lot of fun, but very crowded. 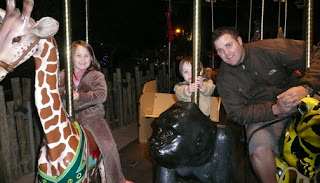 We made our way around the zoo with lots of laughter and had a good time. 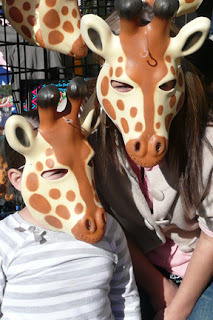 Sadie and Jess gave us a good laugh in giraffe masks! Jess you are quite the animal! Sadie has gone APES! 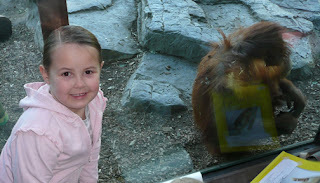 She loved watching the apes and orangutans. So many of them walked right past where we were standing. This one sat and licked the window for a while, gross! Josh is always the good sport! Jess always likes to live on the wild side, or just make Josh work really hard to push her up the hill. 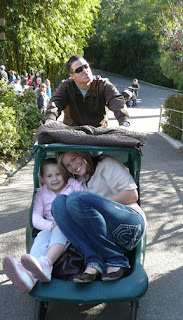 It was funny though to see her climb into that stroller! 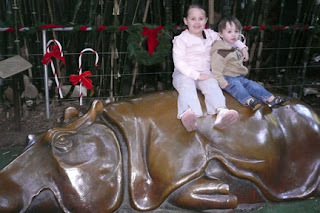 Of course you have to take a picture on the gold hippo. Just after the kids had finished taking their picture Josh and Jess, my sister, decided that they wanted a picture on the hippo as well. Josh slid right off the back end and came very close to splitting his pants wide open. Jess-I still need a copy of that picture! The adventure had just begun! The day after Christmas we packed up and headed to San Diego! We had such a blast! On our way we decided to hit the Wildlife Animal Park on the way into town. We finally found it after about a 2 hour detour and a long windy road. Don't always trust your GPS! Let's just say we didn't see much at the park. 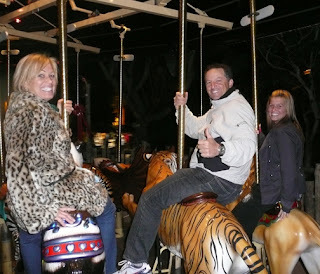 We went on a train ride around to see some of the wildlife and the merry-go-round. Then it was dark! I don't think that we will be doing that again! Mom you fit right in! I think we had the best Christmas possible! We were so lucky to have my parents and my sister here to share in the fun of Christmas Day with us. I have learned that Christmas is all about the kids, and that doesn't stop when your kids are grown and married. Mom and Dad-Thank you again! Sam and Sadie were more excited about the presents that Gammie and Bumpa gave them, so that is what follows. Sam received his first ride on tractor! 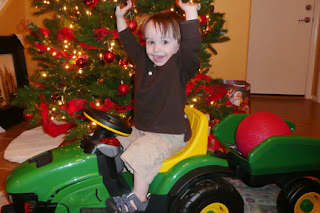 He is a little bit afraid of actually pushing the peddle to make it go, but he obviously really likes his John Deere. Sadie was so happy to finally get Elizabeth. 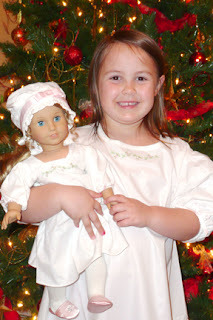 We have had an American Girl catalog laying around the house and Elizabeth is the one doll that Sadie said she wanted to have. I guess it is a good thing that Gammie picked the right one, especially since we had the catalog after the doll was ordered! Thanks mom and dad for making this Christmas a special one!